Soil health is the foundation for a vibrant and strong agriculture system and economy. Healthy soils are essential to healthy environments including clean air and clean water for sustainable agriculture and livelihoods. 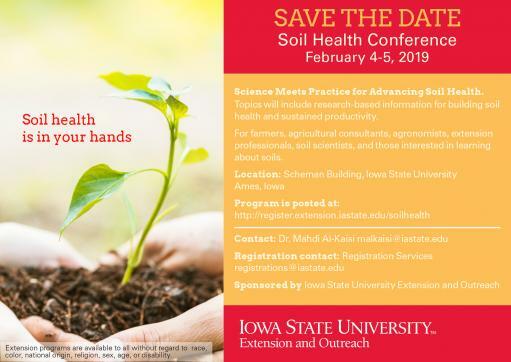 The 2019 Soil Health Conference will be held in Ames at the Scheman Building at Iowa State University on February 4-5, 2019. Registration is now open. This conference is organized by Iowa State University Extension and Outreach, the College of Agriculture and Life Sciences and the Department of Agronomy. The 2019 theme is “Science Meets Practice for Advancing Soil Health” in Iowa and the Midwest. This two-day soil health conference will host a number of renowned scientists, agronomists, framers, and conservationists as conference speakers. Presentations at the conference will address concerns and interests of farmers, agronomists, agricultural consultants, soil scientists, extension professionals, and policy makers who are interested in learning about soils for sustainable agriculture. During the two-day conference, research-based information addressing the soil health principles and management practices in decision-making for building healthy soils, sustainable agriculture, and a clean environment will be presented. Panel discussions led by farmers, agronomists, and scientists along with a new and unique session where attendees can “Ask the Experts” will be included. This information will be provided by scientists from Land-grant universities, USDA-ARS, USDA-NRCS, farmers and leaders in the agriculture sector. Posters on research and education addressing management practices and their effects on soil health will be displayed during the two days conference. This conference will provide an opportunity for certified crop advisors who are eligible to earn continued education credits in soil and water by attending many of the breakout sessions. Program, invited speakers and registration information can be found on the conference website. Registration is currently open and we look forward to see you February 4- 5, 2019 for the conference. Don’t miss the opportunity to learn more about soil health and develop a network with other industry professionals.